New Delhi:. The pioneering entertainment company, Teamwork Arts and Fab India – Home and Lifestyle came together to curate a beautiful setting where music and craft blended together seamlessly. 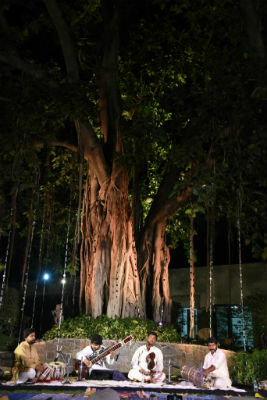 The first concert of a three-part monthly series Under the Banyan Tree on A Full Moon Night kicked off at 1AQ, Mehruali, Near Qutub Minar.The evening began with the young and talented Hindustani classical vocalist Ujwal Nagar setting the mood with his bandish before moving on to Meera bhajan. Soothing vocals of Ujwal paved the way for Indian Classical Instrumentalist Azeem Ahmed Alvi’s ‘North Meets South Sitar’ along with Hafeez Ahmed on the tabla, Sridhar Raghunathan on violin, Vetry Bhupathi on mridangam playing raag kirwani. Azeem born into sixth generation of classical music concluded with recital of Vaishnu Vajanto. As Azeem’s sitar was weaving its magic, it was nature turn to galvanize the event. Right above the Banyan Tree, full moon was in its glory with clouds passing by, a subtle reminder to what was in store. The finale came with Qutbi Brothers, one of India’s most celebrated qawwali singers, inheritors of a 750-year-old tradition. Qutbi Brothers began their first performance with Amir Khusro “Man Kunto Maula” and their Sufi renditions seemed to move the rain gods and it poured. After a brief break, the musical setting moved inside the Ojas Arts Gallery at 1AQ and music enthusiasts witnessed an acoustic Qawwali in all its purity. Qutbi Brothers took the Sufi route to explain the composite culture of the country and in their unique style regaled audience with timeless Sufi kalaam and bhajans.